Toyota is making good progress on a $10 billion investment pledge made this year. Toyota Motor Corp. didn’t trade tweets with Elon Musk in September, but it did announce a $373.8 million investment in five U.S. manufacturing plants to up its shot at remaining the top manufacturer of hybrid vehicles worldwide. Huntsville’s Toyota engine plant, which makes all three sizes of its gasoline engine, will undergo a comprehensive $106 million upgrade to enable it to build engines that complement Toyota’s New Global Architecture. Fifty new jobs will be created at the Huntsville facility. All five projects will begin this year and should be operational by 2020, according to Toyota officials. 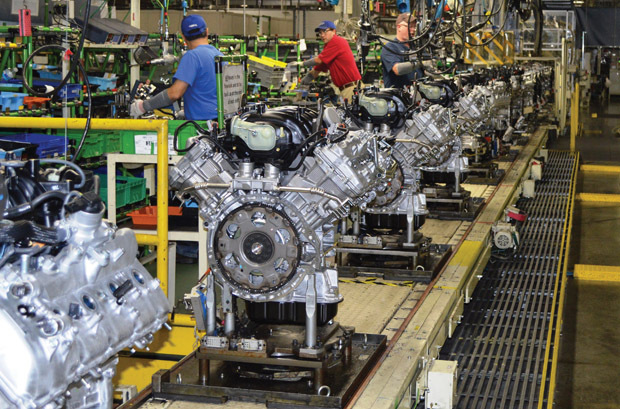 Projects outside Alabama include adding new production of hybrid transaxles at the Buffalo, West Virginia manufacturing facility; expanding 2.5-liter engine capacity at the Georgetown, Kentucky plant; increasing production of 2.5-liter cylinder heads at Bodine Aluminum’s Troy, Missouri plant, and modifying the Bodine Jackson plant to accommodate production of hybrid transaxle cases and housings and 2.5-liter engine blocks. The projects, and others previously announced, move Toyota nearly halfway ($4.1 billion) toward its commitment to invest $10 billion in the U.S. as announced by CEO Akio Toyoda in January 2017.